(Hibiscus Flores, Flor de Jamaica, Red Drops ) Tropical perennial native to West Africa, introduced to the tropics worldwide, grown as an annual in temperate climates. 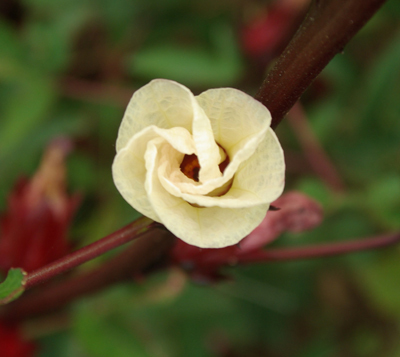 The papery blooms give way to the bright red, fleshy calyces, which may be made into jelly, syrup or wine. 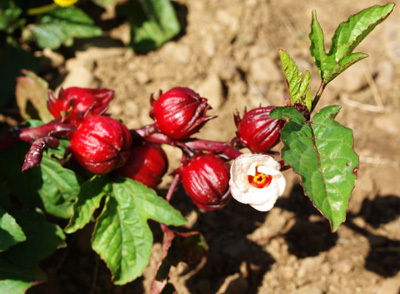 Dried, the calyces are widely used in herbal teas, imparting a bright red color and a tart flavor. The dried leaves are also good in tea. Traditional usage (TWM): tummy ache to tuberculosis. The plant prefers full sun and fertile, fast-draining soils. The seeds must be scarified before planting. This means, pick up each one individually (they are large seeds) and rub on sandpaper or on sandstone until the white endosperm is visible in one small place on the seed. Alternatively, nick the seed with a sharp blade. Once planted, the seed will imbibe water through that tiny hole, the seedcoat will soften, and germination will occur. 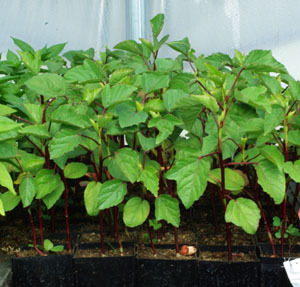 These seeds are best started early in the greenhouse and transplanted out after frost. 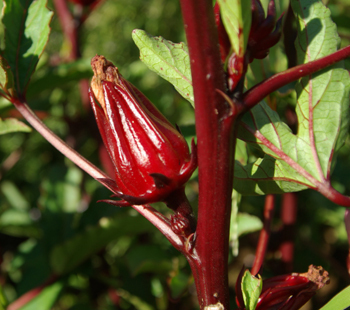 We have found growing Roselle for the calyces to be a very reasonable crop for our mountainous and temperate zone 6. 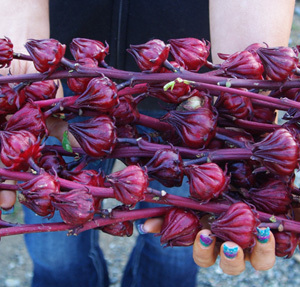 The calyces developed early on squat plants and we had plenty of time to dry a store for later use. 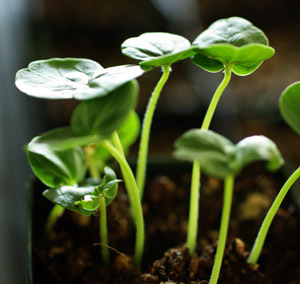 In order to grow the plant for the purpose of saving seed we have to start very early–then the plants have time to develop sufficiently to make good seed. Space plants 1 foot apart. missing something? This year we direct sowed with just as good results as starting seeds early in cold frame. I have grown this gorgeous annual for two years now in the Piedmont of SC. The young leaves are very tasty raw. The short answer is, they are using the calyx and calling it the flower. Most consumers wouldn’t know what a calyx is, and confusion would ensue. This is the first time I have tried to grow this plant. I live in central PA, so I knew there would be challenges. I followed the directions and I had 100% germination and all of my plants lived. You can’t do better than that! It is mid September now and they are just starting to produce buds. I started them inside under lights. They grew well and quickly, but after a bit you could tell they wanted to be outside. Once planted outside, they seemed to just sit there for the longest time, but as soon as the soil warmed more they took off and produced beautiful, healthy bushes. I’m not certain what I could do differently to try to bring them to flower sooner because it seems they like shorter, cooler days to bloom. I will see what I can harvest, if anything due to my location. I plan to bring a couple plants that I left in pots indoors to see if they will continue to produce. 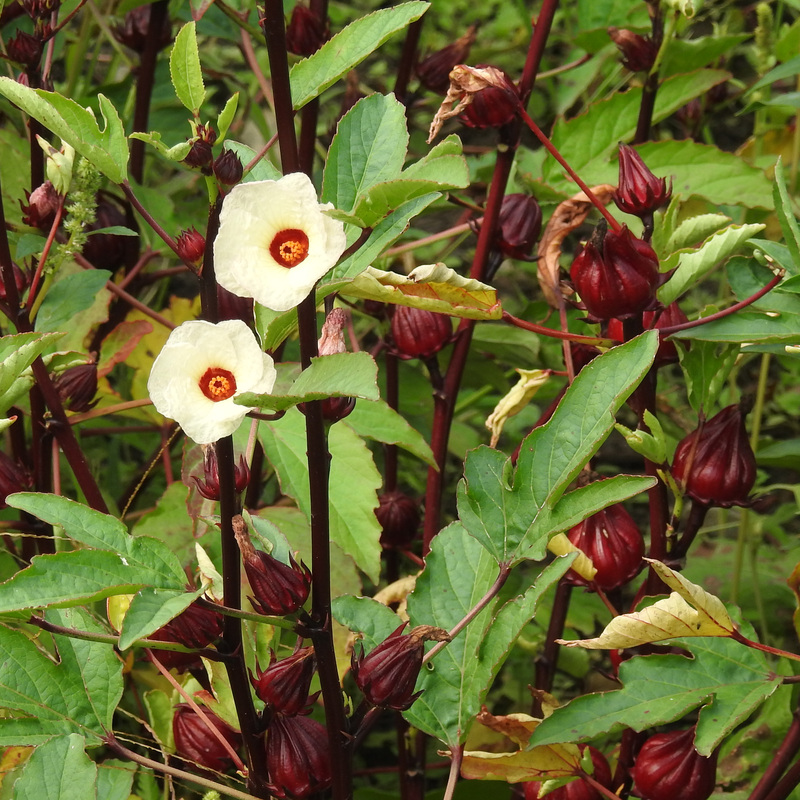 Again, these seeds produced gorgeous, healthy plants! This year we grew lots of these in the greenhouse and after they germinated and grew about 4 inches tall they just sat there and looked unhappy. 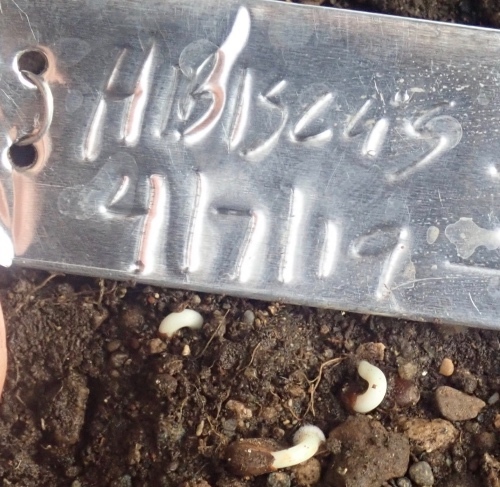 I put them to the field when the soil warmed up, and after a couple of weeks they took off like crazy. I think the secret is to get them planted to the garden as soon as the soil warms up, and it may not make much difference if you use transplants or direct-seed. Just try to make use of every hot day you get.